Blue Origin – the private space travel company owned by Amazon’s Jeff Bezos – hosted a rocket class at Marfa ISD. It’s the first time the class has been offered. 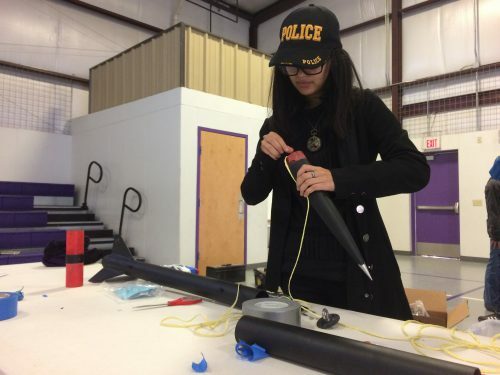 Over the past several months, middle school and high school students in Marfa have been working with engineers to build their own rockets. 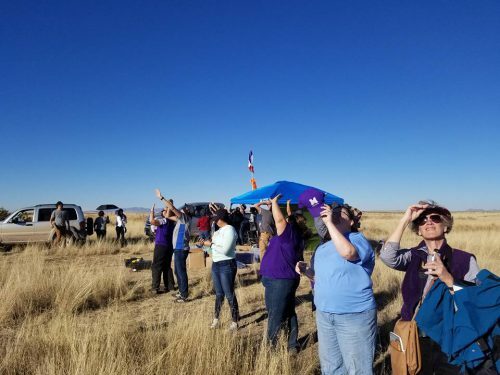 This past Saturday, dozens of parents, teachers, and students gathered at a private ranch a few miles outside of Marfa to see the students’ first ever rocket launch. The rocket class at Marfa ISD was the brainchild of engineers who work at Blue Origin’s Launch and Test Facility near Van Horn. Since September, a handful of engineers have been making the hour-plus trip to teach monthly Saturday classes. They broke the kids up into four teams. 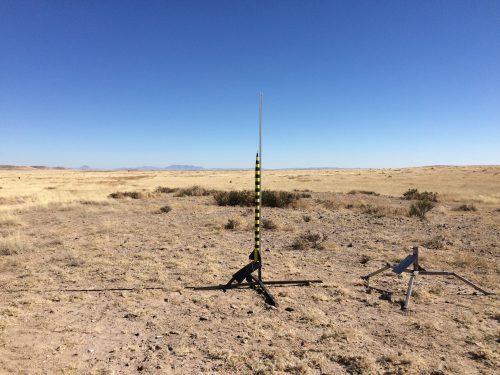 Each team built a 54-millimeter diameter fiberglass Wildman Junior rocket from a kit. “We’re building actually quite powerful rockets,” said Blue Origin engineer, Brent Justice. “These are not just off-the-Walmart-shelf rockets.” According to Justice, the class is an experiment. “This is just something that we came up with down here in West Texas to try to be a part of the community,” he said. Back at the ranch, junior Ana Guerra’s team is ready for launch. Their rocket is spray-painted matte black. It’s named the Black Widow. Guerra and her teammate, Kathryn Hinojos are positioned in front of a big red button, which when pressed will ignite the rocket. After one false start – and some trouble shooting from the Blue Origin guys – it’s time to try again. They place their hands over the button, and the engineers start counting down: “5, 4, 3, 2, 1….” They press the button. With a loud boom and a cheer from the crowd, the rocket disappears into the sky. Later, the rocket’s flight computer will show that it went up about 8,000 feet and reached a speed of mach 0.8 – that’s almost the speed of sound. The rocket split in half, a big parachute deployed, and the rocket sailed safely back to earth. Guerra and Hinojos recovered the parts two miles from the launch site. It was a perfect flight. The best part, according to Guerra, is that the rocket’s body is perfectly intact with no damage. This means that, after putting in a new motor, Black Widow can fly again. The rocket class will meet one more time to review flight data and debrief. It’s not clear yet if Blue Origin will teach another rocket class in the future. This entry was posted in KRTS News and tagged Blue Origin, education, Marfa ISD, Marfa ISD students, rockets. Bookmark the permalink.